Foie gras is a food product made of the liver of a duck or goose that has been specially fattened. Foie gras is defined as the liver of a duck or goose fattened by force-feeding corn with a gavage, although in Spain and other counties outside of France it is occasionally produced using natural feeding. 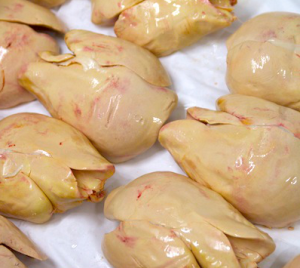 Gavage-based foie gras production is controversial due to the force-feeding procedure used. A number of countries and jurisdictions have laws against force-feeding or the sale of foie gras.